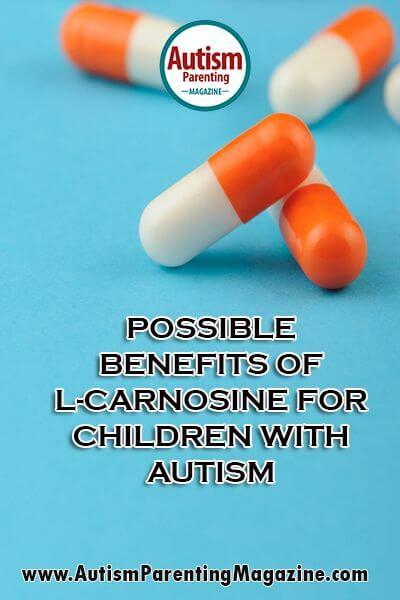 Possible Benefits of L-Carnosine for Autistic Children. L-Carnosine is an amino acid that occurs naturally in the body. The highest concentrations of L-Carnosine are found in the heart, muscle, and brain tissues. Carnosine is classified as a dipeptide, which is a compound made up of amino acid molecules that are linked together. It is thought to enhance frontal lobe function in the brain, and research suggests that it is also a powerful antioxidant. A synthetic form of carnosine is available, and sold as a supplement to help treat a variety of health issues. These include liver disease, cancer, cataracts, and Alzheimers disease. It is also marketed as an anti-aging nutrient. Some doctors and researchers also claim that carnosine can be of tremendous help to children with autism. Research indicates that the benefits of carnosine supplementation in autistic children are usually seen within one to eight weeks after the child begins taking it. Carnosine is tolerated very well by diabetics, and is compatible with both ketogenic, and gluten/casein free diets. It has also been reported that it may improve some EEG abnormalities and the frequency of both myoclonic and generalized seizures. To date, there have been no harmful physical side effects reported by those taking carnosine. However, too high a dose may overstimulate some children, causing hyperactivity, irritability, or insomnia. This mainly occurs in children that have already been diagnosed as being manic or hyperactive, and the side effects usually resolve if the dose of carnosine is adjusted. Many parents have reported that their children seem to sleep better once they are on carnosine as well. Although research indicates that carnosine may be a very beneficial supplement for children with autism, it is important to note that the studies that have been conducted are relatively recent, and there is much about carnosine that may still be unknown. A physician should always be consulted before starting any natural or over the counter supplement. This article was featured in Issue 17 – Autism Awareness and Acceptance! What dose of carnosiine would we give a 8 year old male? We tried this on my 2.5 year old and he shows good improvement. However, after 8 week we reduced the quantity by half and we started to see hyper active behavior again. I have couple of questions. Are there any recommendation on how long this supplement to be used ? Can this be used along with early intervention programs ? Hi, can anyone tell me of a note worthy carnosine supplier. I live in Australia. But need to import because not avail here. My son’s doctor had us order the L-carnosine online from Kirkman Labs. He trusted their quality. Also, they sell it in 200mg capsules, which works better for dosaging. Good luck! Vitacost.com ships internationally and they do ship to India. They sell their own brand and name brands supplements. They sell this supplement in capsule and tablet. The brand called NOW, is of good quality, which is the one I use. You can research the brands and check the ingridients before you purchase. Thanks Arleen for your response. My son is 7 yrs and could you please advise the dosage if I go with tablet and also the duration of the dosage. You can get this in syrup. You can buy in India. L carnosine liquid is available in certain pharmacies in India but you need prescription. You can get from brio bliss distributor. They having it in Syrup form under they branding cognicare. in the research they used 400 mg twice a day. I have a 13 years old that I just started with. I give him 400 once a day and then will increase it to twice in a weeks time. Is this beneficial for adults with autism ? Hi Apeksha! Thanks so much for reaching out to us – your question is an interesting one. We suggest you talk to your child’s pediatrician or family doctor about your concerns on whether to give your child the syrup type of L-Carnosine as well as how many or how often should you give him. Be sure to tell the doctor all your questions and have them noted. Hope your next appointment goes well and you get the answers you need. I need help. my daughter is 2.5 yrs old and dr diagnosis of mild autism. But my daughter was more talkative from 18 months to 26months. But suddenly she stops talking more in 27 months. She was using more youtube those days and addicted to youtube. so she was just singing rhymes of youtube and other words our mother tongue she was not using. so please suggest what to do where shall I go to which doctor. I’m living in Hyderabad. please help me. Hi Mohammad! Thanks so much for reaching out to us. We suggest you talk to your child’s pediatrician or family doctor about your concerns and to get the right solutions for your child’s situation. Be sure to tell the doctor all your concerns. Hope your next appointment goes well and you get the answers you need.